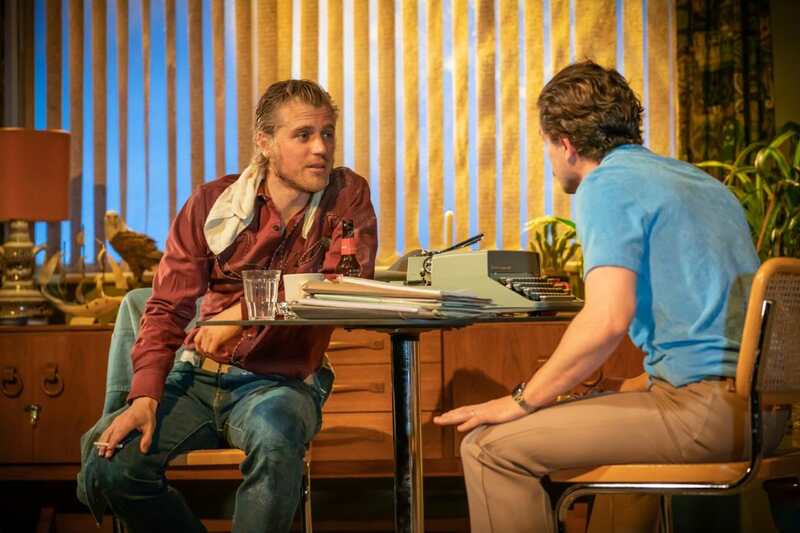 LONDON – Armed with the combined star power of TV stars Kit Harington and Johnny Flynn, this new production of True West already sets itself up with high expectations. 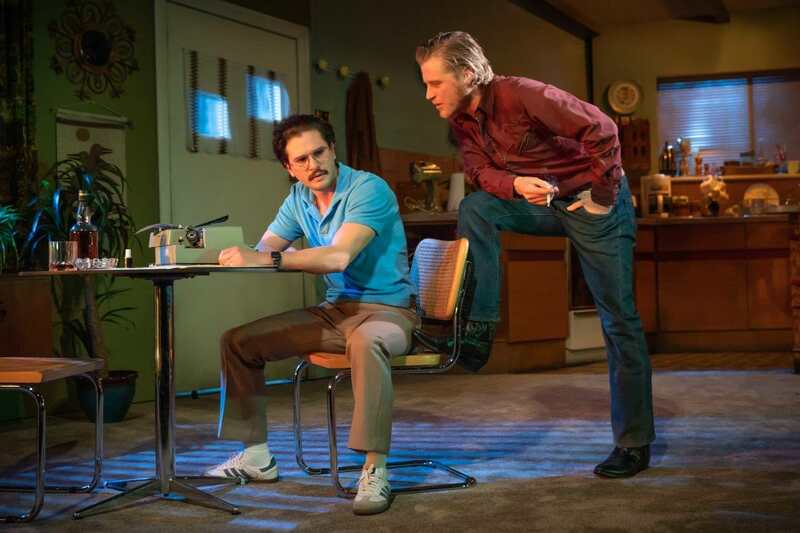 The Sam Shepard classic follows would-be screenwriter Austin (Harington) as he housesits for his mother (Madeleine Potter) while she is away in Alaska. Things don’t go as planned when his estranged, brash brother Lee (Flynn) drops in for a surprise visit on the day he is scheduled to meet with a Hollywood producer (Donald Sage McKay), made even worse when Lee steps in to poach the opportunity from right under his nose (pitching a Western, naturally), reviving a long-standing sibling rivalry that threatens to tear the family and the house itself apart. 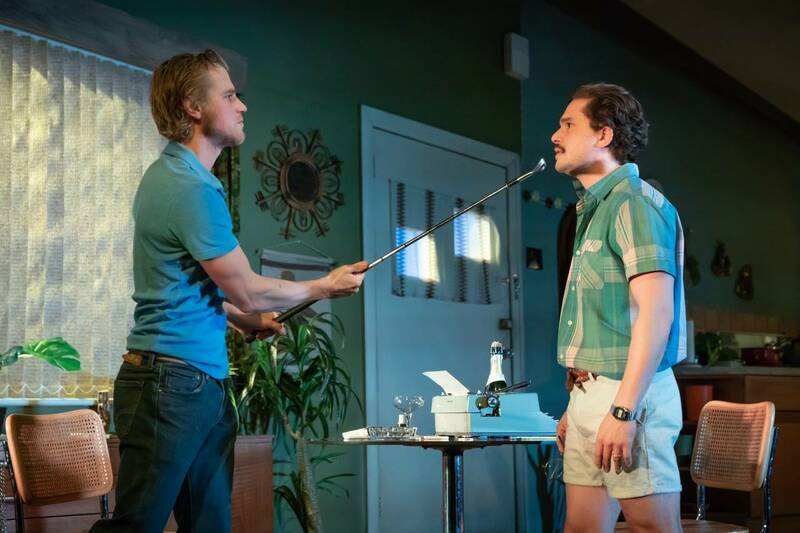 One can practically feel the sweltering, arid Californian desert in the theatre as True West immediately transports audiences to a simpler time. 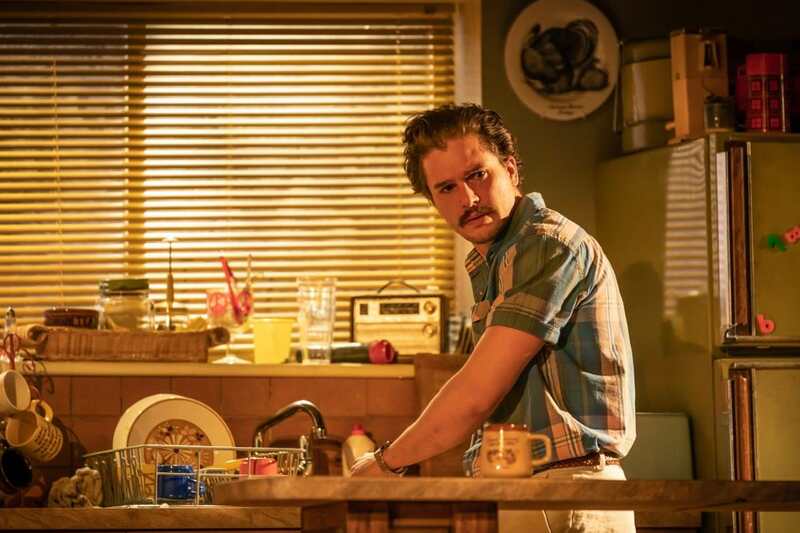 Even before the play begins, Harington is already banging away at an old school typewriter and dressed in plaid, polos and a pornstache. 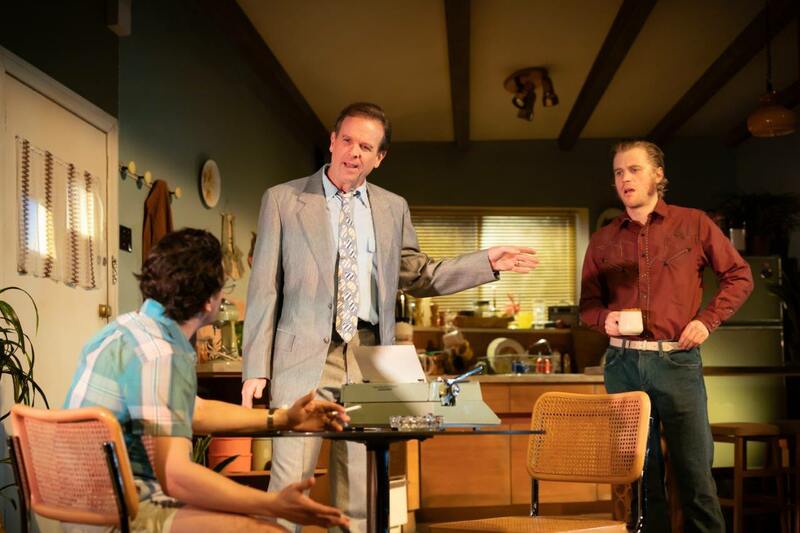 Jon Bausor’s set is an arresting one; the interior of the suburban house, built at an angle, gives the illusion of depth, while Joshua Carr’s lighting streaming through the blinds perfectly depicts the passage of time, orange light signifying dawn and white for the day. 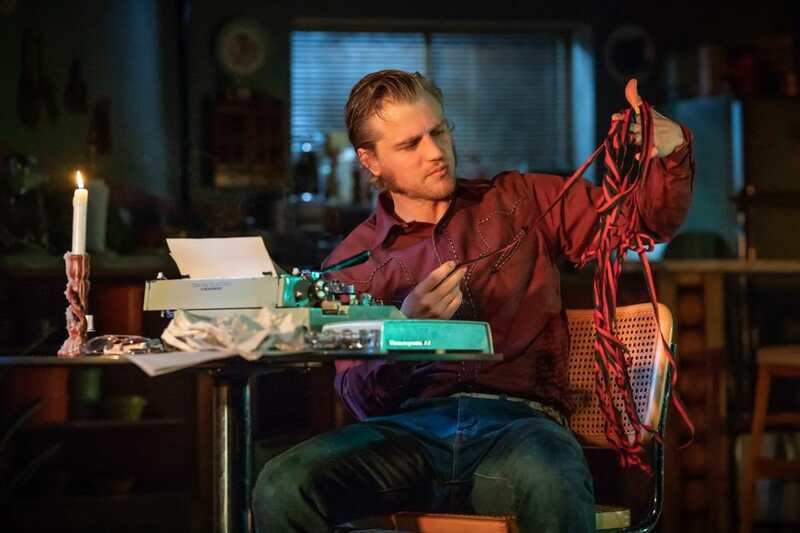 Audiences should also be prepared for a showstopping surprise set change in the show’s second half, irrefutably signifying the change in the two brothers’ relationship forever, it’s increasing messiness reflecting the chaos the play descends into. While for the most part both brothers are tantalisingly antagonistic, going at each other like immature youths, it is the tender moments between them, helped by Shepard’s conversational, genuine language, that surprise and touch when the two find solace and fraternity in their shared memories, those rare moments of agreement striking at how blood runs far deeper than anybody would ever care to admit. 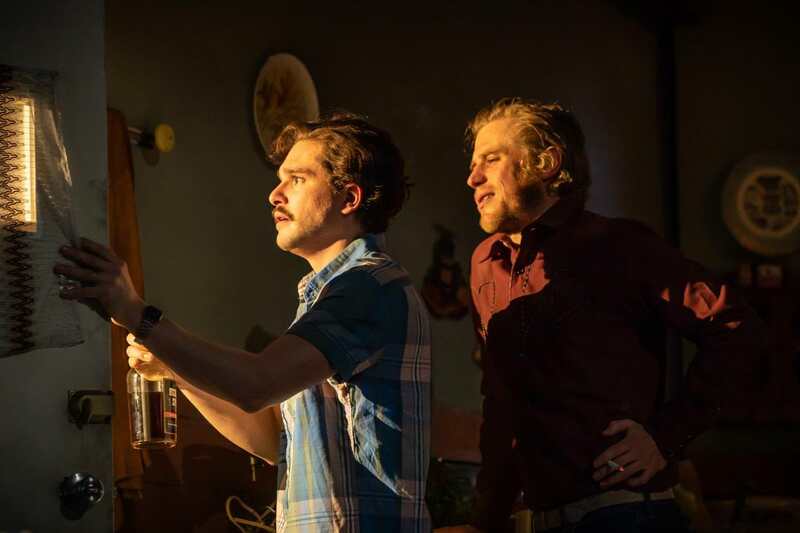 For its rather dramatic subject matter, True West is also surprisingly funny, often delving into absurd, over the top humour, a kind of Buster Keaton meets Cain and Abel aesthetic. Escalating from Austin’s incredulous reactions to Lee upstaging him, to drunken shenanigans and the two brothers physically assaulting each other, there’s a deliciously dark humour that underscores the entirety of the play, and one could even feel guilty at how much one enjoys seeing the brothers’ relationship and the house itself fall apart as they bicker, helped by Matthew Dunster’s direction that often has both Harington and Flynn fully utilising props either as weapons or as visual humour. At the same time, Shepard’s script is a layered one, and director Dunster at times finds it difficult to catch the nuances and tease out the secondary issues of authenticity, class, and broken families without getting caught up in the primary action. There are times Harington and Flynn’s performance, entertaining as it is, begins to feel repetitive, especially towards the end once they’ve reached the height of their conflict. That being said, what True West results in then is an absurd production rooted in the universal basis of the all too familiar issues of sibling rivalry, entertaining in seeing two TV stars fall apart in domestic drama, and to an extent, painful in watching the idea of America and the West itself come apart at the seams through the destruction of a family already on the edge.